The second Distinguished Unit Citation was awarded to the 463rd after the group bombed the Daimler-Benz tank works in Berlin on March 24, 1945. The Citation was presented to the Unit on May 25, 1945 in the name of the President of the United States, by order of the Secretary of War and General George C. Marshall, Chief of Staff. "The 463d Bombardment Group is cited for outstanding performance of duty in armed conflict with the enemy. On 24 March 1945, this group was notified to prepare maximum aircraft to lead a wing formation on a mission to attack and destroy the Daimler-Benz Tank Works in Berlin, Germany. A successful completion of this mission would materially reduce the enemy hopes of a prolonged defensive against the Red Army then deployed on the eastern banks of the Oder River. Realizing the strategic importance of this undertaking, the deepest escorted penetration ever attempted in the European Theatre of Operations, and one hitherto deemed all but impossible from bases in Southern Italy, the ground crews enthusiastically and sedulously labored day and night to bring all available aircraft to the peak of mechanical efficiency despite the extensive battle damages incurred in the almost daily operations of the preceeding month. Operations and Intelligence personnel indefatigably applied their greatest efforts to supply the carefully selected crews with vital bomb and and target data. On 24 March 1945, thirty-one B-17 type aircraft loaded with maximum bomb tonnage took off, made rendezvous with other groups of the Wing, and after assuming the lead, set course for the objective. The Alps crossed, and having bypassed all known flak areas in Austria and Czechoslovakia, the group had almost entered Germany proper when suddenly and without warning it was savagely opposed by a concentrated and sustained antiaircraft barrage which inflicted heavy damage to nearly the entire formation and destroyed four heavy bombers. Despite the intensity and accuracy of the heavy guns, the gallant crews battled their way through the many defenses, reformed the temporarily demoralized and scattered aircraft of the Wing, and were successful at holding the entire formation intact at this critical stage of the flight. Passing out of the effective range of the gun emplacements, the battered group was immediately attacked by 15 jet propelled enemy fighters firing cannon and rockets which were only dispersed by the belated but aggressive appearance of friendly fighters after another bomber was destroyed in the running battle. 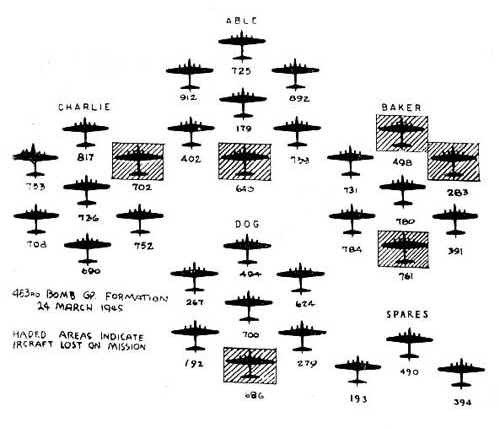 As the fight continued, the crippled airplanes were realigned into three squadrons for the dual purposes of protective cover and bombing accuracy. Nearing the specific target, the flak-riddled formation was for the third time subjected to a stiffened enemy resistance and a sixth ship was shot down, but not withstanding the severe damage sustained by the aircraft, the unnerving experiences just passed, the improvised character of the formation, the last minute change of bombing calculations, and the weariness induced by many hours spent at high altitude, the 463rd Bombardment Group relentlessly and unswervingly led the entire wing formation through for an exceptionally successful bombing run, with the complete bomb tonnage of its formation concentrated in the target area thus inflicting extensive damage to vital enemy installations and supplies so greatly needed by the enemy in its defense of the capitol city. Turning off the target, the formation rallied and turned for home. The long and still hazardous trip through heavily defended enemy terrain over mountainous regions and finally over water was too great a strain for 6 of the 20 airplanes which had reached the heart of the enemy's productive system and these were forced down at friendly fields in northern Italy and Yugoslavia for medical treatment to the many wounded men as well as mechanical repairs to the crippled aircraft. Only 14 of the original attacking force were successful in reaching their home base, but in no instance was there a reported case of insufficient fuel, so brilliantly had this mission been planned and so skillfully flown. By the conspicuous courage, airmanship, and determination of the combat crews, together with the outstanding professional skill and devotion to duty of the maintenance crews, the 463rd Bombardment Group upheld the highest traditions of the armed forces of the United States."